Fundamental rights of Indian citizens have been publicised and written about. But what about Fundamental Duties? According to prominent advocate, the fundamental duties have remained in the Constitution book and have not emerged enough, even to the legal cells. 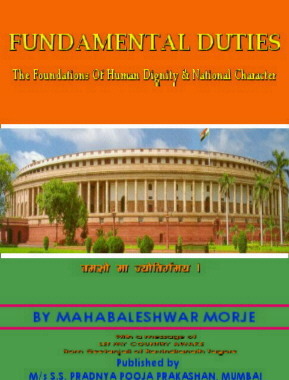 In a bid to highlight these Fundamental Duties, advocate Mahabaleshwar Morje, author , professor and consel for state has written a book titled Fundamental Duties - The Foundations of human dignity and national character. This book is first of its kind on this subject. "The Fundamental Duties are described as ‘the foundations of human dignity and national character’ because these duties deal with religious, historical, philosophical, moral,social, educational, cultural and legal aspects of human dignity and national character. " explained Advocate Morje. The book is divided into six parts with the last part being the conclusion.Part I deals with history and object of fundamental duties on the basis of religious commentaries based on Shrimad Bhagwat Geeta, Quran, Bible etc. It also refers to philosophical background of duties from early days of great philosopher Socrates. Mr. Morje says that duties are considered as Ten Commendments. The Penal Provisions are considered not necessary as it is the duty of every citizen to obey and perform the fundamental duties in the interest of mankind and welfare of the nations. Part II of the book deals with discussion on each fundamental duty with a comparative historical, educational culturaland legal study. Part III refers the Judgements of the Supreme Court and High Courts. Part IV refers to the Law and Jurisdiction regarding the Fundamental Duties. Part V refers to the constitutions of several other nations including U.S.S.R, China, The Federal Republic of Germany, Japan, Czechoslovakia, Spain, Venezuela, Yugoslavia, Italy, Argentine, Finland, Rumania,Korea, Nepal, Albania, Egypt, Guatemala etc.